I’m not only a live performing musician but a studio musician and producer as well. I have tried dozens of different headphones over the years and almost invariably breathed a sigh of relief when an old pair died just so I would have an excuse to buy another pair. It seemed like finding the perfect pair of headphones was like searching for the holy grail. To be honest, I still haven’t found that perfect pair of headphones but I have found a couple headphone solutions that have kept me satisfied for a while now. In an earlier post I told you about my Shure E530PTH sound isolating earbuds which I use with my live in-ear monitor system. I really like the Shures but they make it difficult to communicate in the studio because they are difficult to keep taking out of my ears to talk to the other musicians I’m working with. I really need a great pair of closed-back headphones to use in the studio simply because of the years of using that type of headphone in studio situations has made me used to being able to take them off when I need to communicate. When my last pair of Sony studio headphones came to an untimely demise (the cord got tangled and tripped over) I had another excuse to go looking for a great pair of studio headphones. While doing head to head comparisons at the local audio shop of several different types of headphones from various manufacturers I finally tried the Sennheiser HD380 Pro headphones and I was taken aback by how rich and full they sounded! The first thing that hit me was how good the bass sounded. The bass response of the HD380 Pro headphones is deep but not mushy. You can hear the attack of the bass drum very well and then a full blossoming of bass frequencies behind it. It’s really hard to describe in words as it’s just something you have to hear. The overall sound of the headphones is warm without being overly bright or crisp. I hate it when headphones have too much sizzle to them which other headphones are prone to do with cheap drivers. The HD380 Pro’s have very smooth frequency response and seem to slightly favor bass frequencies but in a well balanced way. They do seem to be more suited to rock and electronic music than orchestral or classical music. That makes them perfect for the rock music that I love. The next thing I noticed right off was how comfortable the earpieces are. They enclose my entire ear and are padded with a pillowy foam cushion that never makes my head sore even after a 3-hour recording session. The entire design of the HD380 Pro’s allows you take the headphones completely apart, piece by piece if you want. This makes it easy to replace worn out parts like the cable or earpads. Remember the cord tripping incident that killed my Sony headphones? Well the same thing happened to the Sennheisers but the cord just popped out of the Sennheiser headphones and I was able to plug it in and keep my headphones going without any grief. I did wear one cable out because I rolled a studio chair over it too many times but I like these headphones so much that I just bought a replacement cable for them. Replacing the cable was as easy as unplugging the old cable and plugging in the new one. You can also replace the headband cushion and driver elements as well. Another thing I really like about the HD380 Pro’s is their sound isolating capability. When you put some music through them the pads really seal out all external sounds. It’s really surprising how well they sound isolate from the microphones as well. I can crank them up as much as I want and I don’t ever pick them up through the microphone. They are rated at 32dB of external sound attenuation which is about as much as those yellow foam earplugs you see at concerts. The Sennheiser HD380 Pro headphones come with a 3.2 foot single-sided coil cable which extends up to 9.8 feet, a 3.5 mm stereo mini jack with a screw-on 1/4″ adapter as well as a very nice carrying case to store them in or take them with you. With a frequency response of 8Hz to 27KHz and and Sound Pressure Level of 110 dB they truly do sound fabulous. I highly recommend the Sennheiser HD380 Pro headphones for your studio or just casual listening whenever you want the best sound. 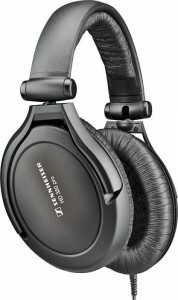 Sennheiser HD 380 PRO HeadphonesSave BIG when you buy today! ive been eyeing them for a while now. thing is.. i live in southafrica and i spoke to the sennheiser rep….. the shipment only going to come in the next month with the earphones on it…. DaMN these 3rd world countries. but i cant wait. i already pre-ordered. and is looking forward to give them a GOOD running in. Okey… im not a pantient person. Waited the whole month for these sennheisers. And they finaly have stock. A pair of HD 380 Pro’s are on there way to me. and should be here tomorrow…… if not another 3 days i have to wait. I SHURE DO HOPE THESE HEADPHONES ARE REALLY GOOD!.. Witch means these HD 380 Pro’s Could handle a output with more power. so you are getting enough POWER to the headphones. of the lesser AUDIO sources? Francois, good for you that your finally going to get your HD 380’s. I have noticed that I do have to turn my iPod up a little bit louder with the Sennheisers than the cheaper headphones that come with the iPod. With the iPod earbuds I have to turn my volume up to about 1/3 and with the HD 380’s I have to turn it up to 1/2. At about 1/2 on the iPod output volume the HD 380’s just rock! If I crank my iPod all the way up with the HD 380’s it’s too loud. The detail in the sound will blow you away when you listen to your iPod with the HD 380’s. The HD 380’s will show some weaknesses of the iPod but it’s not too noticable. My Shure SE-530-TPH ear monitors make the iPod sound horrible because they’re just too detailed in the midranges. The Sennheisers are more balanced toward bass so the iPod sounds fabulous with them. I fall asleep listening to the iPod through the Sennheisers because they’re so comfortable too. If you listen to your computer with the HD 380’s you’ll hear weaknesses in your soundcard if it’s a cheap soundcard. Let me know your thoughts on the HD 380’s when you get them. Hopefully you’ll love them! Its now like just before 12:00 here is SA. And…… no Sennheisers yet. well normaly they only deliver after 13:00 so i guess i have to wait still. But if they do show up today im going to give them a good listen to this weekend and come write my report on Monday. Well one thing is for shure. Every single reveiw i have read up on. Everyone says the same about the comfort. And im SO glad about. And ofcourse when it comes to the sound…. alot of mixed opinions but thats because everyone has there different taste. and the really DIE-HARD AUDIOPHILES only SWEAR to an open headphone design……(well it is true that is is better) …. but i need a Closedback design for my use. thanks for your reply. hopefully ill be back on monday with my opinion. So got them. and yes let me go test them. had a really quick listen… and first things first….YES INDEED COMFY! very COMFY. Now i know what PPL mean about Natural SOUND …. Hey Francois, I’m stoked you finally got them! I agree that the open headphones sound the best but they also cost a lot more. In the studio, my good mics pick up too much noise from the open backs so the HD-380’s are better for what I’m doing too. But im pressed for time. As much as i like the Bass (REALLY LIKE THE BASS) response and the really good Low range these babies preduce and just exellent quality of the bass. crystal clear really well detailed high’s WITHOUT HURTING YOUR EARS!……. I just have to say again… DETAILED sound. i could hear sounds in the background of music tracks. im talking about when a piano’s note is let go of and it has that (thump) when it returns and hit the top bank. now of course that depends if the original recording picked up that sound on their Mics. and the mids… there is nothing bad about the mids. i can’t say anyting negative. its just…. how it should be. clear. Bass…………. REALLY Good low extension. Ps…. i listened to some of my dads music…. (artists) that i DO NOT LIKE!!! and they sounded good. i didn’t mind listening to his music. They just make everything sound really good..
just been reading your reviews since I’m in the market for new high-end headphones, but im afraid i don’t know enough about the technicality and intricacies of headphones. In my research, I’ve narrowed it down to the fact that I would prefer closed phones and that they need to work well with my ipod touch since thats mostly what i use for my music. Also, I’ve been using the HD201s for about a year now and really like their design in terms of long-wearing comfortability and their light-weight. Now, with this established, I’ve found only two that I’m excited about – the HD280s and the HD380s. There’s VERY little about the 380s anywhere on the net and the 280s have had extreme reviews – ranging from HATE it to ABSOULETLY LOVE them. I really dont know which would be better for me. I would be grateful if you could give me a more experiences, proffesional review on these so i know which ones would be better to get. Hey Shariq, in all fairness I haven’t used the HD280’s but I have read other reviews about the HD280’s. It sounds like the biggest drawback to the HD280’s is comfort. From what I understand they squeeze your head pretty tightly. So, what I can tell you about the HD380’s is the padding on the headphones and on the headband is very comfortable. I can wear them for a long time without any discomfort. As for sound quality between the HD280 and the HD380, I can’t really tell you because I haven’t used the HD280’s. I can tell you the HD380’s sound amazing and they sound wonderful with my iPod. I really don’t think you’ll be disappointed with the HD380’s. Awesome! Hey Shariq, when you get them will you come back to Live Musician Central and leave your thoughts on the headphones? I’d love to get your input on them. Nice reviews guys. I’m as well out for a new pair of headphones,which will beused when i play drums. So I thought I should ask if there is good outside noise isolation? Hey Jocke, the sound isolation is very good on the HD 380’s. They’re rated at 32 db’s of isolation which means they’re about as effective as those yellow foam earplugs at blocking external sounds. That would make them excellent at dampening your drums. The downside for drumming with them is they don’t clamp real tight on your head. That makes the HD 380’s very comfy to wear but if you toss your head around a lot when you drum, they may slide around some. I have noticed you are all talking about these HD380’s. I was recently also looking for a new headphones. For the first time looking for something better than usual walkie headphones – Koss Porta Pro. As far as I like Porta, they not very good for what I am looking for. I am an amateur musician. I am usually making instrumental electronic calm music with little orchestral influence to it. And I need something that will reproduce well balanced sound without too much overexagerating some of the sound spectrum. To shorten it a bit. I have borrowed three cans from an internet shop. Sennheiser HD80, HD380 and Beyerdynamic DT990. All of those are PRO versions. Senn’s are both closebacks, where Dynamics are open. I have to point this out, because the sound and purpose is different. How ever, these are my observations. Little bit too had on my head. They clamp your head and sits there. Not very comfortable for long sessions. But well, I wouldn’t care if the sound would be worth it. The high’s are very clear and bright. Mid’s are well balanced to this. Low’s are little to much fade out. You can hear them, but the overall sound thanks to those bass frequencies is not well balanced. Much better for wearing – good leap up for Sennheisers. Much better low’s. Hay, yes, I can hear very well the walking bass in some songs and it fills well the spece in my head. Mid’s – oops. I don’t like it. I will later tell you why. It’s maybe nothing you will notice at first or second listen or without comparison. I didn’t, at first. But the mid’s are sort of squeezed. It sounds a bit “canny” to me. Like there would be maybe a hollow at some frequency in the middle section. I am not sure exactly where, I am not that good. Enough about mid’s. High’s are quite ok. Not that bright as with 280’s, which could be better speaking long-term. Bright high’s might be fatiquing to some. But to my need, I prefer clearer high’s. Overall, good listening device, especially when in the closed back category. They isolate very well, even if 280’s are better in this. Just my feeling. Those are openbacks. In quiet surrounding, people can hear what you are listening to, when you have it little louder than it needs to be. However I cannot hear anything when listening through them. But when I stop the music, I can actually hear what my wife is saying to me – isn’t necessirily a good thing 🙂 But good for studio purposes. Beware, they do spill a sound into mic’s, so not good for vocalists or recording with mic’s. You know what I mean. However, not a problem for me, I am mostly doing “one thing at a time or totaly inside of the computer. They are the most comfortable for wearing. Their pads are….just great. Uncomparable to 280’s or even 380’s. Those cans are great for mixing, I think. They have solid bottom end, good mid’s and very nice high’s. And the feeling of the space and clarity of all the sounds in the mix is unbelievable. Something I didn’t know until I heard them. Those make the grand piano sound really like in the orchestra hall and not in your head, if you know what I mean. Yes, HD380’s maybe has bassy and puncher lows that make the sound sound’s better, but when you compare those two, Beyer’s must win in the believable sound. The piano with 380’s sounded as I said, canny. You don’t notice, until you compare to something else. Saying all this I want to point at one thing. No matter what your choice will be. You need to learn your cans and after that, you can compensate for what flaws or unbalances those your cans have. Do you know they are losing in lows, add them in the mix, etc. So for tracking and recording, HD380’s are a good choice. For general listening and mixing, my choice would be DT990. I actually asked the clerk in the shop before borrowing the headphones, what he would recomend for my purposes. And his answer was: “Beyerdynamic, there is no question about this. All the others are more or less copies of what Beyer does.” I thought, yeah yeah, he wants to sell them. Well, maybe he wanted, but he was right. However, I would like to hear their DT770 RPO, which are closedbacks. That would be more fair to my tested Senn’s, being from the same group of phones. However, I will probably keep those 990 for future. They are excelent for mixing. Sennheiser HD 650 Open-Air Pro Headphones. I just needed a closed back set for recording vocals and the HD 380’s fit the bill better. Although I may still pick up a set of HD 650’s for mixing purposes. Yeah, I have heard good things about HD650, but they are sort of different price tag for me. What sort of work you do? You record guitar work, drums and other live instruments and then voice? I listen to music in the same room as my wife sometimes is watching TV, so wanted a good pair of closed back phones. After much web research in the £100+ range I whittled it down to two: Audio Technica M50’s and Sennheiser HD380Pro’s (£130 and £120 resp). Listening in the shop the difference is quite marked – not in quality, but in the type of sound they give. The M50’s feel very cosy and in your own private world, a warm foetal sound. The HD380s are cooler (less pronounced bass), less all-enveloping, but seemed to have better mid-range – they just sound more aristocratic. Both were very comfortable, but the Sennheisers seemed much lighter and sit well away from your ears, whereas the AT’s touch them, albeit just on the edges. I listen almost exclusively to classical music, and I’ve plumped for the Sennheisers. I’ve had a pair of wonderful HD600s for many years and I like the precise German sound of this maker.